Living in the snow region of the country, we have to be creative in getting active as a family. Now that it is spring, it is a lot easier. The kids love to head to the park with us. 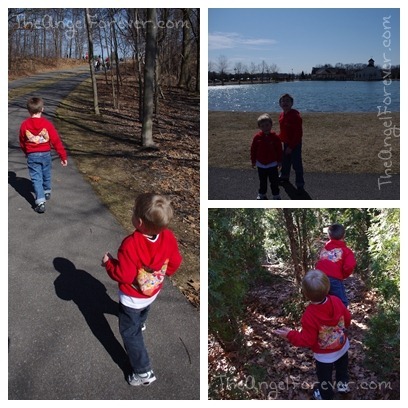 We wander around the playground, head onto trails, wander in the hedge mazes and more. NHL is 8 and is much more aware of being active, eating healthy foods, and junk foods in moderation. He actually started going to his school’s Just Run club. The kids also know that I wear a pedometer to try to track my activity. Both of the boys think it is a lot of fun to compete with our walks and see if we can beat our last pedometer adventure. This summer, I am sure we will be doing even more treks to try to visit places and save money on gas for the car. Together Counts is a program for everyone. The goal is to help to inspire families to lead healthy and active lives. Energy Balance is a key element and major principle of the program. Quite simply, this means that the calories that we eat are the ones that we burn. Together Counts brings together 195 retailers, food/beverage manufacturers, restaurants, sporting goods stores, insurance companies, non-governmental organizations, and professional sports organizations to get the message across. For additional information, head to the Together Counts website learn more and take their pledge on finding balance and moderation. Together Counts is having a sweepstakes right now on their Facebook page to celebrate their first anniversary. Prizes include gift cards, George Foreman Grills, and a membership to Anytime Fitness. Of course, Together Counts is also on Twitter and Pinterest. Tomorrow evening, April 3, be sure to join Together Counts as they celebrate Child Nutrition Month during a Twitter party from 8-9 EST. Prizes include $50 same-as-cash gift cards. There is more information and to RSVP over at Resourceful Mommy. So have you made the Together Counts pledge yet? If not, what are you waiting for? Disclosure: I wrote this post as part of a compensated Global Influence campaign. As someone who strives to find balance, I love the principles behind Together Counts and am happy to share this with my readers.